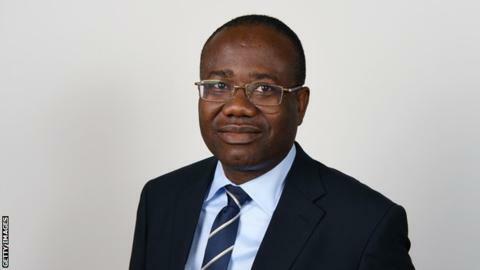 CEO of Bechem United, Nana Kwesi Darlington, has openly declared that he wanted ex -Ghana Football Association (GFA), president Kwesi Nyantakyi out for George Afriyie to continue as the president. Talking to Nhyiraba Kwabena Asirifi on Rainbow Sports, the tough talking CEO said he wanted Kwesi Nyantakyi to resign for George Afriyie to take over as the because had all the qualities to become the association leader. “I started supporting George Afriyie long ago even when kwesi Nyantakyi was the president of the GFA. George Afriyie has been tried and tested, gone through the mill and has all the qualities to become the GFA president and I don’t think anybody stands tall to become the GFA president aside George Afriyie. “I wanted Nyantakyi out because Ghana football was heading towards a nose dive and it came to a time George Afriyie and Kwesi disagreed on a lot of things and it clearly showed the two were on bad terms. When asked why he wanted kwesi Nyantakyi out he said, it came to a point when there was no correct time for the resumption of our league and there were dispute among the clubs and some decisions by the disciplinary committee over their decisions, clearly things were not done right. We should all support George Afriyie to become the next GFA president. George Afriyie,Osei Palmer ,Nana Yaw Amponsah Mensah, Kurt E.S Okraku ,Nana Owusu Ofori etc have declared to contest for the GFA presidential seat.